It is always great to try out new cuisines and new flavours. Oriental cuisines have been of particular interest for me because of the interesting uses of Soybeans, Mung starch, Sea weeds and their fermented foods. And if such a cuisine is being showcased somewhere close by I am always game for it. 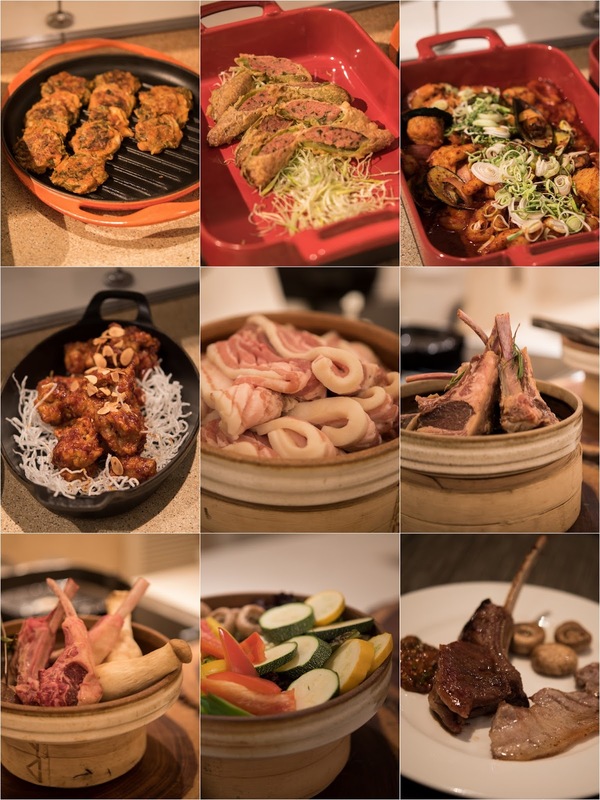 Latest Recipe, the all day dining restaurant at Le Meridien Gurgaon is hosting a Taste of Korea festival from 1st to 17th April and it is a great opportunity to go experience the real flavours. 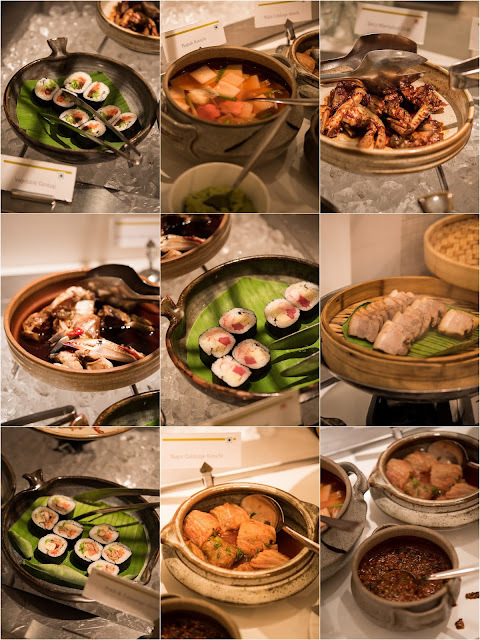 In fact it is quite far for me and yet I made an effort to go and interact with Chef Wang who has put together the menu. 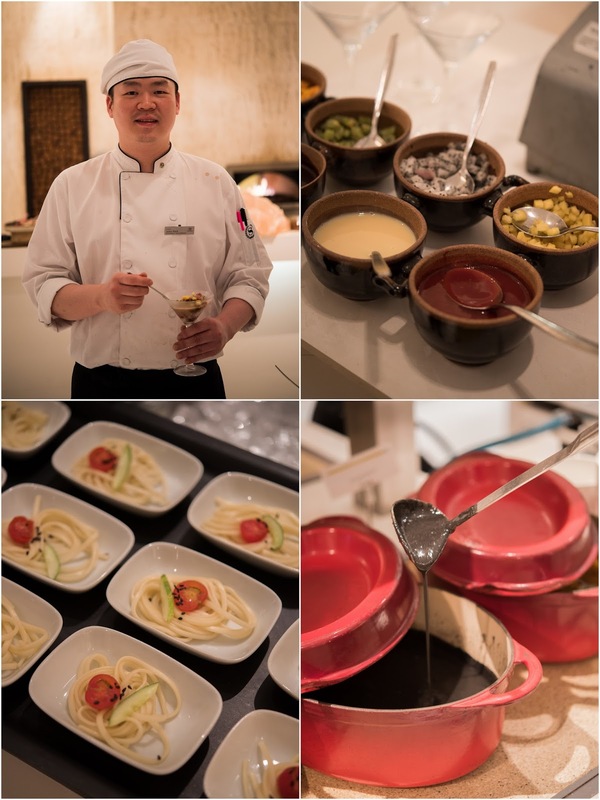 Chef Wang is Korean and has come especially to curate this festival at the hotel and this is his first India visit. It was a bit difficult to communicate with him because he doesn't know much English but he is quite a sweet person and kept answering all my queries about the food and the cuisine. The first thing that caught my fancy was a thick slurry like black sesame soup and Chef explained that it was made with sesame and sticky rice. A bit sweet and a bit salty, this sticky porridge like soup became one of the best finds for me. I tried and liked the kimchi stew too. I was interested in knowing more about kimchi and how he has made it. Chef informed me that since the aged Kimchi is a cultivated taste and it takes long time to make it, he has made water kimchi (Nabak kimchi) with radish, carrots and green onions etc. Napa kimchi was also there with visible red chilli paste but it wasn't hot for Indian palate. I loved both types of Kimchi and it was really good to see real kimchi being served even if it was a quick version. 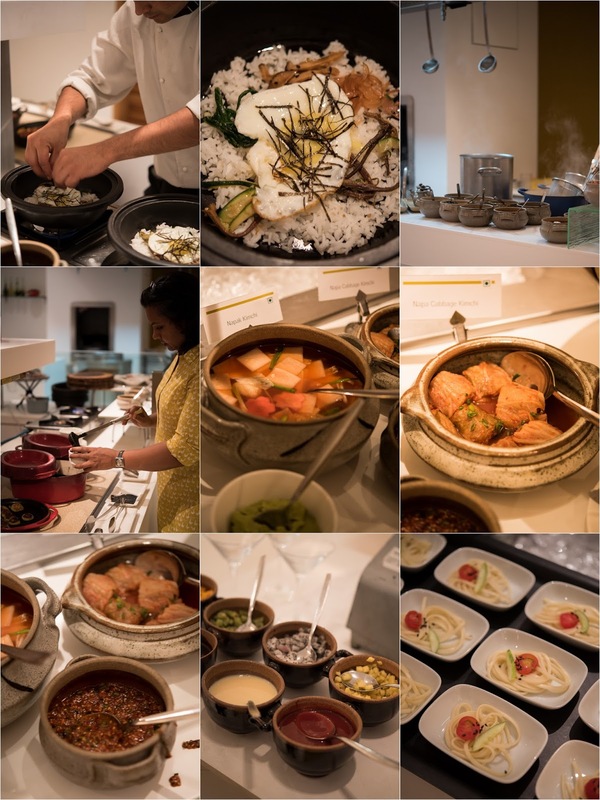 The Korean menu is being served as a buffet and there are cold and hot stations along with a live Bibimbap station, a live grill and Shaved ice station that is quite interesting. Some street foods are also showcased and that is where you will get everything that tickles your taste buds and makes you happy. I quite liked the Seafood stir fried rice cake, the kimchi pancakes and the Stuffed peppers from the street food station. My favourite was the spicy marinated crab which was actually hot and sweet and jelly like in texture. Spicy fried chicken was also almost same flavours and must have been a popular dish. Bibimbap was recommended by Chef Wang and we liked it, though it was not our favourite from the menu. I loved the steamed Dumplings with pork and kimchi more. From the cold station I loved the variety of Gimbap and Mung bean jelly salad. Interesting use of ingredients and wonderful flavours though a little bland but I like tasting the elemental flavours. The pork belly and Lamb chops from the grill station were both very well done. The dessert station had some drinks that I loved. A cinnamon punch and a sweet rice punch both were really interesting. The sweet rice dumpling with nuts and jujubes was like a miniature modak but different in taste. The Fried cake was like our sugar coated fried pastry, Sesame puff was actually like sesame brittle that we already love. The most interesting dessert was shaved ice with a sweet bean jelly served with bits of assorted fruits. It was the most interesting use of soybeans and something that I would like to experiment sometime soon. Although I am not sure this kind of a dessert will be accepted by Indian palate but I love it when hotels have the conviction to serve something so authentic in it's real form. If you love Korean food you must go and experience it and find a way to talk to Chef Wang before 17th of April.